Summer’s here, and I’m spending lots of time outdoors – you probably are, too. And for me, that invariably means coming in contact with poison ivy. I do my best to avoid it, but once or twice a year I do manage to break out in a rash. That’s why I always keep this amazing plantain and jewelweed home remedy for poison ivy rash on hand. The remedy is often found growing in the same area as the poison ivy plant. A classic example of poison ivy, but the plant can take many forms. 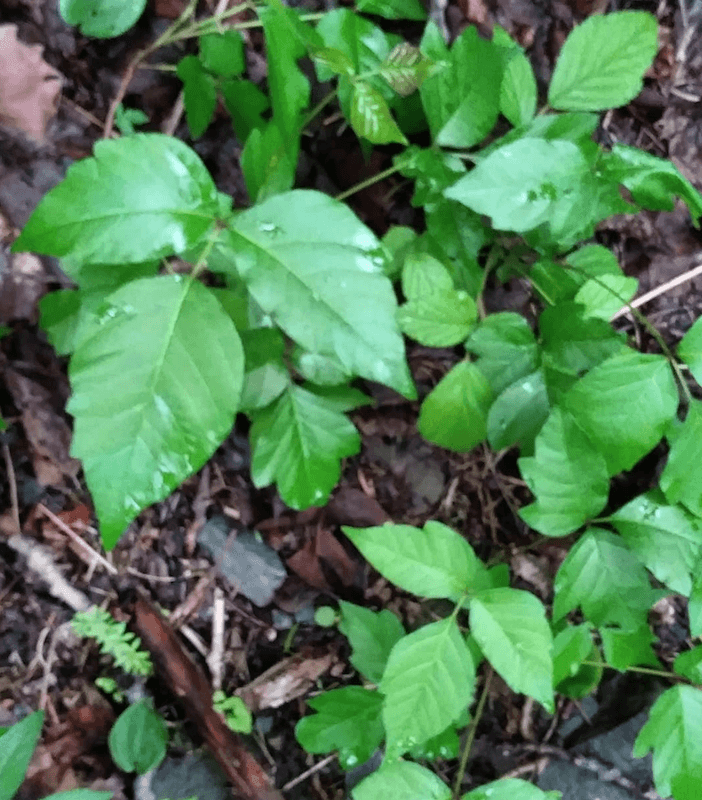 Prevention is the most important step in keeping poison ivy at bay, and that means that being able to identify the poison ivy plant is essential. Poison ivy, Toxicodendron radicans, is an interesting plant in that it takes many forms. If ever a plant has tripped me up as far as identification, it is the poison ivy plant. Having an awareness of its many forms is helpful. Here in Pennsylvania, poison ivy is generally only seen as a vine that grows up trees, or sprawls on the ground. But in warmer climates it can take the form of a bush or shrub. You’ve heard the saying, “leaves of three, let it be.” If you are really unfamiliar with plants, that’s a good place to start, but there are lots of other plants with leaves of three that you may want to enjoy. Wild raspberry, for example, has 3 – 5 leaves and may resemble poison ivy at first glance. If you are interested in learning more about plant identification, see my post The Forager’s Guide to Plant Identification. Notice the reddish tint to the younger poison ivy leaves. On poison ivy, those infamous three leaves are actually just one compound leaf, with three leaflets. These leaves are often shiny, but don’t count on that as a certainty when identifying the plant. They may also be dull. Each leaflet has a pointed tip and is generally 2 – 4″ long. The leaf margins (the edges of the leaves) may be toothed or smooth. Observe the three leaflets and notice that the middle leaf is attached with a longer petiole (stalk) than either of the two side leaves. The two side leaves are sometimes found in the shape of mittens with thumbs. The leaves are deciduous, and may be light green, dark green, or may even have a reddish tint. In the fall, they turn a beautiful, scarlet red. Each set of three leaflets is arranged alternately on the stem. Not everyone is allergic to poison ivy, but for those who are, it can produce an itchy, painful rash. Having a plantain and jewelweed home remedy for poison ivy rash on hand is wise. The poison ivy plant contains a sticky, oily resin called urushiol. This sap can cause severe inflammation resulting in a painful, sometimes blistering, rash. 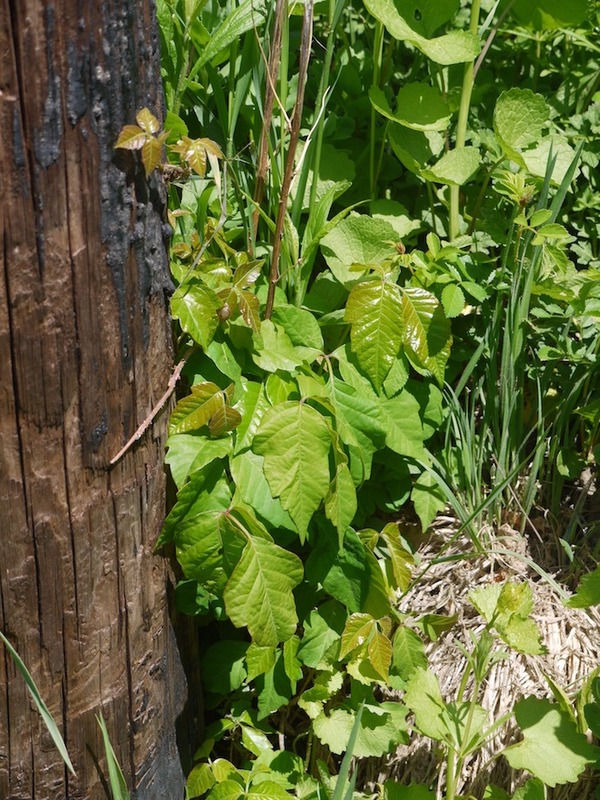 If you are exposed to poison ivy and don’t have the home remedy ready to go, both the plantain and jewelweed plants may be used immediately for relief. Just crush a plantain leaf or jewelweed stem and apply directly to your skin. Washing your exposed skin with soap and a wash cloth is also a great first step in preventing a rash from forming. 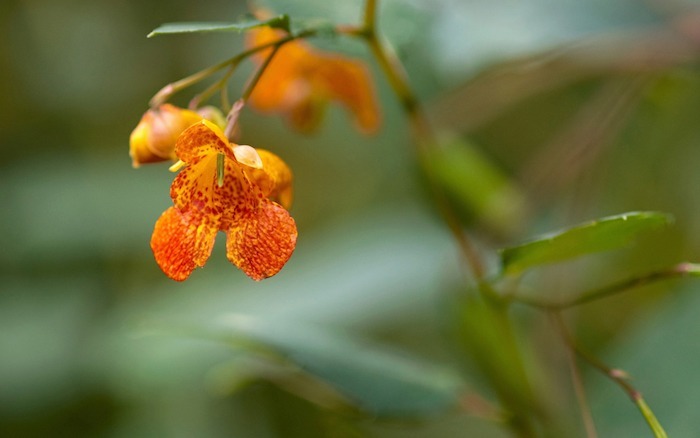 Keep in mind that jewelweed has been found to be more effective as a preventative than as a cure. 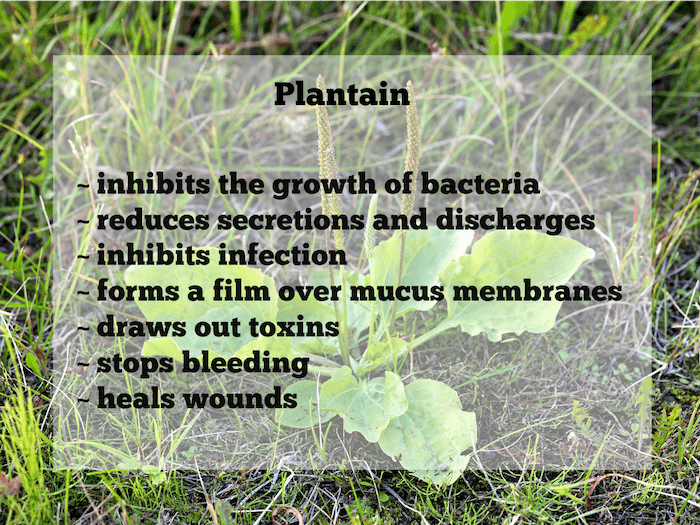 Plantain is anti-inflammatory and is the real star in this poison ivy treatment. The two most common varieties of plantain are broad leaf (Plantago major) and narrow leaf (P. minor). 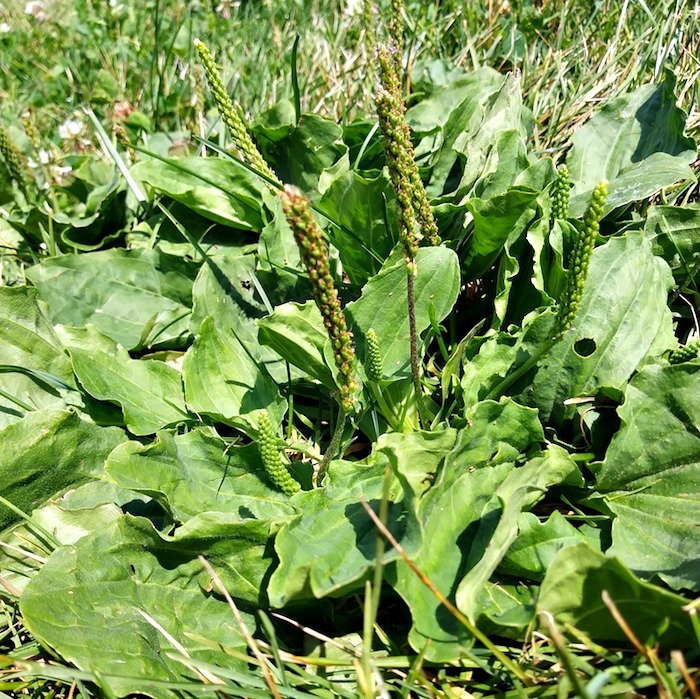 Plantain is common in areas where the ground has been compacted and can withstand being walked upon quite easily. Plantain leaves grow in a basal or rosette form at the base of the plant. Broad leaf plantain has wide, egg-shaped leaves with several veins running the length of the leaf. Narrow leaf plantain has long leaves and resembles wide grass, and like broad leaf has long veins that run the length of the leaf. When harvested, you’ll notice that the leaves of both broad leaf and narrow leaf plantain are stringy. 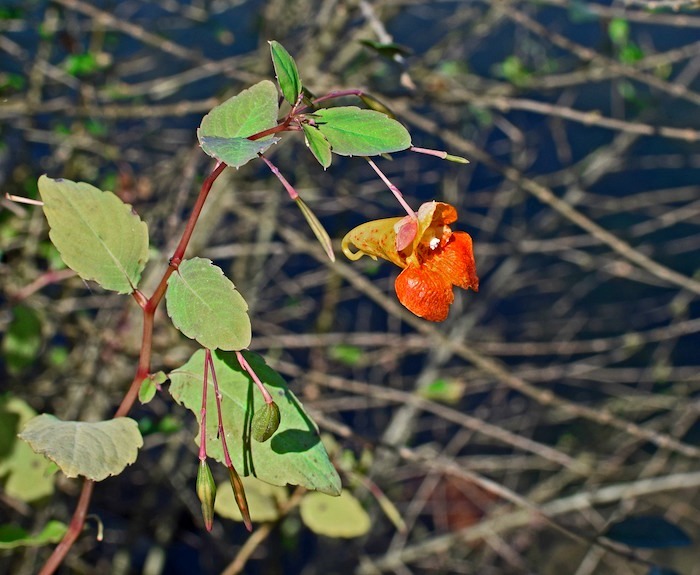 Jewelweed, Impatiens capensis, prefers growing in moist, semi-shady areas. It is an annual with an orange, spotted, irregular flower. (See The Forager’s Guide to Plant Identification for more information on flower shapes and other ways to identify plants). Jewelweed’s seed pods sometimes explode when touched, hence its other common name – Touch-Me-Not. Jewelweed has oval-shaped leaves with toothed margins. It’s upper leaves are alternative, while its lower ones are opposite. It grows throughout most of N. America in swampy areas, and in wet ditches along sides of roads. My home remedy for poison ivy rash can be made with just two ingredients – plantain leaf and distilled witch hazel astringent. (For a great buy on witch hazel, click here, but note that you do have to purchase 6 bottles). The witch hazel will also contain 14% alcohol as a preservative. Jewelweed may be added as well, but is an optional ingredient. If witch hazel grows in your area, you may even make your own witch hazel tonic. Is it a Weed or is it an Herbal Remedy? 1. Wash the plantain and jewelweed (if using) and then finely chop. 2. Place the chopped plant material in a jar and cover with witch hazel astringent. Cover jar with lid. 3. Allow to infuse for 1 - 2 weeks, occasionally shaking the jar. 4. Strain the mixture, and store in a jar. 5. Label with contents and date. The home remedy for poison ivy rash will keep for 1 - 2 years in a cool, dark place. 6. 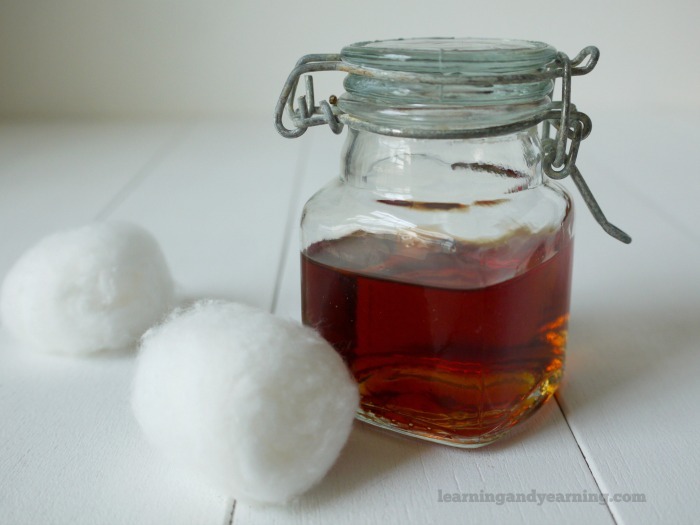 To use, soak a cotton ball in the natural remedy and apply to the poison ivy rash. You can also simply rub the inside of a banana peel on the affected area, leave on and it will dry up very quickly…usually within a 24 hour period. Poison ivy is abundant here and so is plantain so I will have to try this as it sounds simple enough. Hi Krista, yes, it really is an easy process, and has been so helpful to me. I so wish I had this recipe 3 months ago when I was covered in it. Thank you for sharing your knowledge. Hi Carolyn, I recommend getting some made so that you have it on hand. Hopefully, there won’t be a next time, but it’s best to be prepared. Poison ivy is so painful!